Here we have it, I pulled in my first fish of the season, an 18" striped bass caught from Casco Bay. 2013 is going to be my "Year of the Fly" - I took a two day fly fishing course at L.L Bean a month ago and I'm now hooked (excuse the pun.) However, on this particular day fly conditions were tricky and this fish was eventually pulled in on my spinning rod with my favourite lure. Saltwater fishing is geographically a lot more accessible for me but fly fishing in the sea certainly posses its own unique set of challenges. Rest assured when I pull in my first fish on a fly you will be the first to know and, as tradition dictates I will finally be allowed flip my "L.L.Bean Outdoor Discovery School" button the right way up. 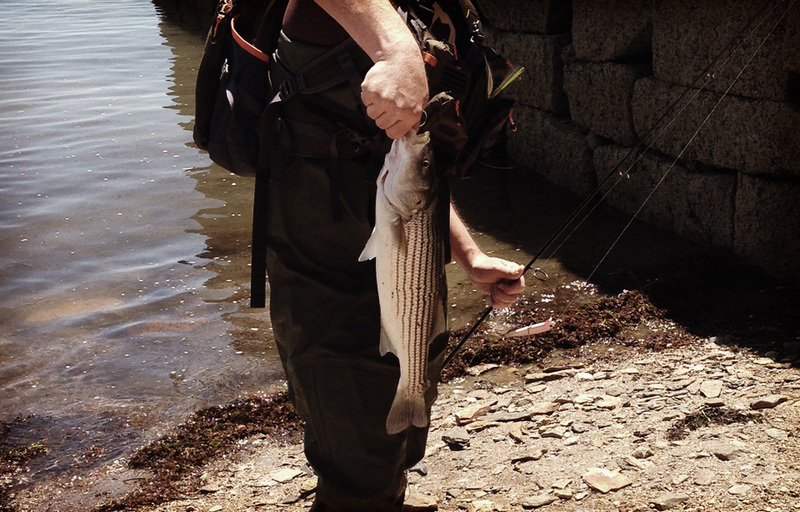 Posted on June 23, 2013 by admin and filed under VHD and tagged Casco Bay First fish of the season fly fishing L-L Bean Outdoor Discovery School striper.